If you follow the blog, you know that Lorrell and I decided to do a clean eating challenge for 14 days, starting on May 17th and ending on May 30th. We did pretty well, keeping a strict adherence to the menu, even eating and enjoying things that we normally would not have tried. It all came crashing to a halt on Friday the 29th at roughly 7:30 pm when a slice of pizza from Piccolo Venti hit my tongue. Friday was an awful, horrible no good day of food. It started with a horrific breakfast and ended with sauteed zucchini and quinoa. It was also a rainy day and Loriana was at a sleep over so Lorrell and I had a date night opportunity. Quinoa and zucchini are not date night material, that is for sure. The actual beginning of the end started with Lorrell exclaiming that she wanted a pizza. Words that seldom if ever come out of her mouth to be sure. The night ended with beers at Cheyenne Brewing Company and Tuskers Bar. Hey, when we fail, we do it full speed ahead. In truth the Clean Eating Challenge was good for both of us. I lost 10 pounds, or just 5% of my body weight over two weeks. Six days later, I’ve still maintained that weight loss. Lorrell experience similar results. We made a menu for this week that included a fair number of clean eating meals, such as last nights shrimp and avocado salad and today’s venison steak salad. We will probably do an intensive clean eating couple of weeks in the fall and maybe an entire month in January while I’m doing my 2nd annual Dry January anyhow. I’m glad we did it, I’m even happier that it is over. One of the cool things about the BuzzFeed Clean Eating Challenge that Lorrell and I have been working our way though is that it sets you up to reuse the proteins to make quick, and easy meals during the week. This past weekend called for roasting a pork loin that would be used for Monday dinner, Tuesday lunch and Thursday lunch. With it being Memorial Day Weekend I figured in the spirit of American BBQ’s, it would be more appropriate to smoke the tenderloin. I could not have made a better choice. Set up your smoker to smoke at 225 degrees. Trim any silver skin or fat off of the tenderloins and apply yellow mustard in a zig zag pattern. 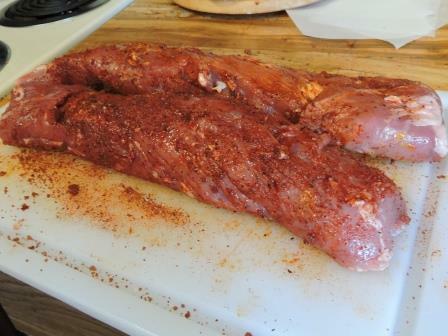 Apply your choice of rubs, I used the rub from Smoking-meat.com, but any rub will work. Make sure the entire tenderloin is covered. Place the loins in the smoker smoke until their internal temperature reaches 135 degrees. For these tenderloins I used maple wood smoke. Wisk together the Dijon Mustard, cider vinegar and paprika. When the tenderloins are at 135, baste them with this glaze and place back into the smoker until the pork is at 145 degrees. Total smoking time for me was roughly 2 hours and 45 minutes, but it will depend on a number of factors. Let the meat rest for 10 minutes and then enjoy. We served it Monday night with roasted butternut squash and a mixed greens salad. Tuesday for lunch we had it with cauliflower rice and asparagus. Today’s lunch is a shaved pork sandwich with cheddar cheese on a portobello mushroom bun. There is still some left over to enjoy later this week. 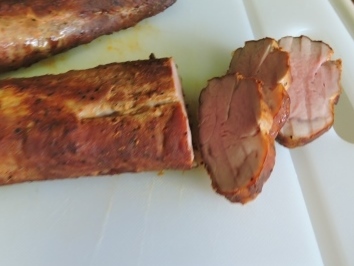 The smoke flavor on these tenderloins was the best smoke flavor I’ve managed in the six months of owning a smoker. They were also tender and juicy. One final note, it is perfectly safe to eat pork medium rare. I’ve never been a big pork fan, but so much pork in my life has been served medium well or worse. When I think about it, I like no meat cooked over medium. Chicken may be the exception to that rule, but give me beef, venison, elk, bison and pork all medium rare please. If you are not eating your pork medium rare, you are missing out on tender, low fat juicy meat. A quick update, Lorrell and I have been doing the BuzzFeed Clean Eating Challenge for the last 11 days. I’ve lost 10 pounds and am on the precipice of breaking 200 for the first time in 20 years. I’ll be sharing some of the better ideas from time to time. 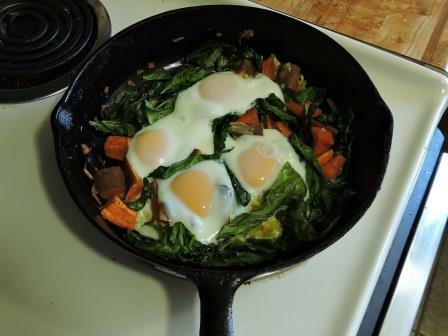 On Sunday we had a breakfast dish of Baked Eggs in Garlicky Collard Greens and Sweet Potatoes. This not a dish I would have every cooked before, but it is one that we will cook again to create some variety in our breakfast routine. Heat olive oil in a medium skillet over medium heat, then add the sliced garlic, sliced collard greens, and paprika. Cook, stirring often, until the collard greens are bright green and slightly tender, about 2 minutes. 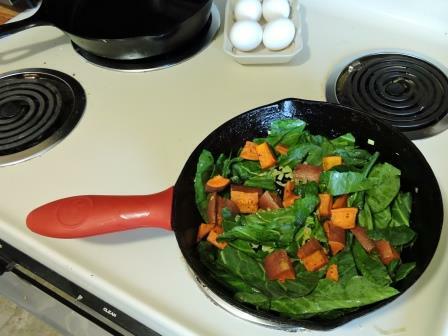 Add the sweet potatoes and spread the vegetables to cover the bottom of the pan, creating small nests for the eggs, then crack the eggs on top of the vegetables. Season with salt and pepper. Bake in the preheated oven until the whites are set but the yolks are still runny, 8-10 minutes. Eat immediately while it’s warm. The dish turned out to be very good. I’d never been one for collard greens before, but I now know that is because of unfamiliarity not taste. They held up very well in this dish, whereas I did a similar dish with spinach and it didn’t hold up nearly as well. The eggs were overcooked slightly, an easy fix as I went the whole 10 minutes and I should have stopped at 8. All in all, this dish will be added to our breakfast rotation, and will be a good one to eat when looking to keep breakfast light ahead of a heavy eating and drinking day. A few weeks back Lorrell sent me a Twitter link to Buzzfeed’s 2015 clean eating challenge. To my surprise she was up for it and we decided that once she got back from a business trip we’d give the two week program a try. Its not that we eat totally unhealthy but convenience and habit watch us fall into the same old patterns of eating during the week, and by god that time between 8 pm and bed, we both pick, pick, pick. We’ve both been on our individual weight loss journeys over the past five years, and for me it always seemed that from about Easter to Labor Day each year I’m good for falling off the wagon. Over the last five years I’ve lost over 75 pounds, but since moving to Wyoming there has been about a 25-30 pound swing that I seem to be good for, and I’d love to stop that swing. Plus I’ve still never gotten to my goal weight of 195. This challenge seemed like a good way to alter some habits for two weeks, maybe find a recipe or two that we could incorporate into our routine and to try and lot of fresh food that we normally walk past in the grocery store. Today is day 6 of the plan, and I’ve got a few observations about this plan. I’ve lost 7 pounds in 6 days, and I’m at the lowest weight I’ve been since 1995. I’ll never get back to 180 which is where I graduated high school, but I’m within 8.5 pounds of that elusive 195, and only 4 pounds away from seeing a 1 as the first number on the scale instead of a 2. We have always excelled at eating better when we plan a weekly menu out. With the three of us constantly on the go it is easy to grab and go dinner. I spent $250 at the grocery store last week, depleting the checking account to the point where grabbing and going isn’t a smart option if we want to pay our bills. Having a planned out menu has been very helpful, and it has allowed us to view lunch with trepidation, or dinner with excitement. I have no energy. I’m not getting enough calories out of this to work out. I ran 4.2 miles of a 5 mile work out on Tuesday and thought I would die. My heart rate was elevated dangerously. Walking up stairs is brutal. I could not sustain a diet of 1300-1600 calories on a regular basis. I’m nervous about getting into week two of this as it is. I have decided to supplement with extra fruit and veggies to boost the calories without shooting the plan all to hell. Today I brought an extra banana to work just in case. Chia pudding is the worst thing I’ve ever put in my mouth. I gagged on the first spoonful and forced myself to eat the entire bowl. Horrible. We skipped that the 2nd time around, and made an omelet with leeks and cheddar cheese. Much better. What we have found is other recipes for Chia seeds since we have a giant bag of them that was about $6. Giving up caffeine, white sugar, and alcohol all in the same week is much like quitting smoking cold turkey. I could easily kill someone at any moment for no reason what so ever. The anxiety I feel is the same as what I used to feel for a cigarette. We don’t realize the addiction our bodies have for these three substances. We have found some excellent recipes. We had a spaghetti squash with ground turkey the other night that was outstanding. We used the leftover squash last night for the dish in the picture at the top of the page. I’ve eaten a ton of eggs, six yesterday to be exact, and two more today. We’ve gone through better than two dozen this week. It’s good I like eggs. We’ve eaten a ton of spinach. It’s gone in smoothies, salads, and entrees. It’s a good thing I like spinach. Last but not least we are learning some new habits. I had to sit through a brewers festival committee last night and not drink. I’ve brought my lunch every day this week. We’ve sat down and eaten dinner almost every night this week. These are all good things. Unfortunately we decided to do this during Memorial Day weekend, so we have to skip the beers and bbq this weekend, but I truly believe we are getting our summertime off to a much better start than we have in past years.